Modern Mormon Men: 2019 April General Conference Rumors. Ok here we go, the possible changes, rumors of changes and just plain old speculation on what’s coming up for conference this weekend. Enjoy Conference Weekend! We have no doubt this is in the works. Changes in the temple are clear precursors to the change, just as changes in the temple were precursors to the changes in Blacks receiving the priesthood. Is it going to happen this conference…? I don’t think so but it’s coming for sure and I would not be surprised to see some changes in responsibilities of the Relief Society this weekend, such as seeing them make and extending their own callings. Changes in who and how you serve in a proselyting mission. The rumors are that the selection process in regards to who can and maybe who is “asked” to serve in a proselyting mission. With the changes in status and respect of those serving service missions. Look for an increase in breadth of service missions. Rumors are that the church is going to shift to having fewer proselyting missionaries, and might even go back to the days where you are called to serve a mission before you even apply to serve one. This would shift proselyting missions to by “call”, rather than by volunteering. However, look for service missions being built up to handle those who are not called to proselyting missions. Temple building is going to Slow down. NOPE. Nelson is on a big push on all fronts, he is not going to slow down on building temples especially since we now know the positive economic advantages to building temple. Members that live within a few hours of a temple are much more likely to be full tithe payers. Youth programs to be announced. I think this is going to happen this weekend. Look for YM and YW to achieve the same “Eagle” or “Duty to God/ YW Recognition” type award. Also look for changes in the Faith in God award. 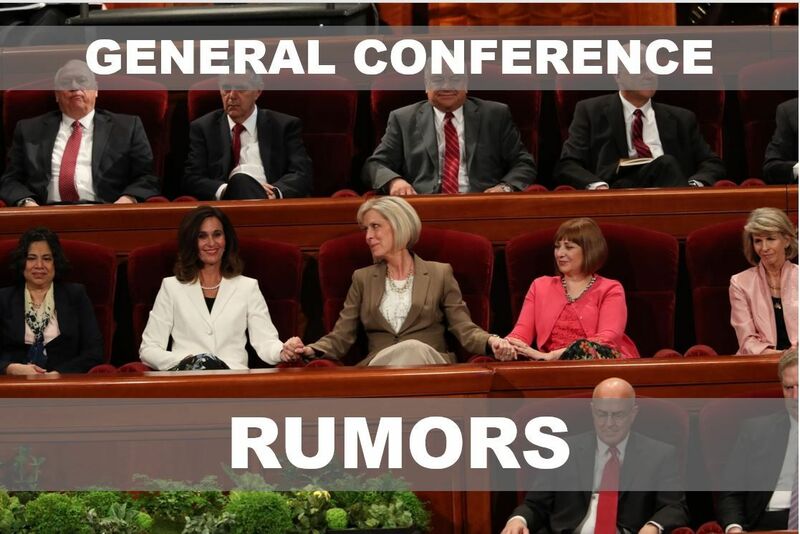 Also, a rumor that YM and YW will meet together more often for Sunday quorum and YW Classes. Formal Limits and Procedures for Church Discipline of LGBTQ members. We know some formal guidelines are in the works for this. I don’t think they will be released in conference but we might see them talk about it. What to look for here are rules against trying members more than once for the same situation and official lines for what behavior constitutes church discipline. The issue has been that action by members in one ward might warrant no discipline, but the same actions in another ward can get a member excommunicated. Don’t look for everything to be spelled out, but look for a new section in Handbook 1 with a few more guidelines. Got any good Conference gossip? Put it in the comments!